DEBORAH CROMBIE: Here on Jungle Red we've talked about mistakes writers make in American books on legal matters, so I thought it would be fun and informative to get an expert's view on the mistakes in the television portrayals of the legal system in the UK--especially LAW & ORDER UK, because although it's a great cast, when I watch the show I always think, "Really? They'd really do that?" So I asked Ayo Onatade to give us the scoop. Many of you may know Ayo from mystery conferences, from her contributions to the SHOTS blog, and from her involvement in MYSTERY WOMEN, a UK not-for-profit organization created to raise the profile of crime fiction. But I knew what Ayo's day job was, and now she's going to tell you. 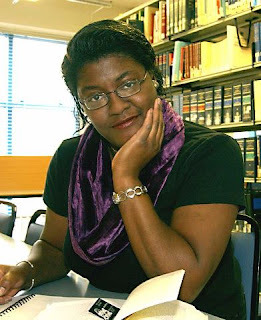 AYO ONATADE: In August, as usual I attended St Hilda’s Crime and Mystery Conference. The theme this year was “The Anatomy of Justice” and I gave a paper on “Life along the Judicial Corridor”. Not a lot of people knew what my day job was as I am generally extremely vague about what I do. Working with Judges has meant that I have a rather more jaded view on books, films and programmes that have courtroom scenes. It did however get me thinking when I was invited to do a guest blog on Jungle Red Writers about the differences between the US and UK legal systems. It also made me think about crime novels that are court based. I freely admit that I don’t really have a problem when it comes to reading US authors that base their books and storyline in the US court system mainly because I do not have an intricate working knowledge of the US legal system. On the other hand, I do have an intimate knowledge of the UK court system, which is where I work. This does cause a major problem with me when it comes to reading books, or watching television programmes that involve courts as I am constantly picking holes in them. Two programmes that come to mind are Law & Order UK and Judge John Deed! The mistakes that I saw in them made me growl with annoyance. I am all for artistic license but please! Some people completely forget that these programmes are fiction and they believe everything that they see on television. It ’s a bit like the “CSI effect”. People think that DNA evidence takes minutes instead of days or sometimes months! The only programme that I can remember getting things right is Crown Court, which they used to show in the seventies! I freely admit that I barely watched any Law & Order UK. This was because I knew that I would be unable to watch the programme without getting thoroughly annoyed. Law & Order UK is based on the US television series albeit with the US episodes adapted for the UK. Generally speaking it is a really good programme, however there are things about it that don’t ring true. Members of the CPS (Crown Prosecution Service) are overworked, underpaid and have a caseload that is unbelievably high. They do not have the luxury of having more than one member of the CPS on each case. You will never see 3 members of the CPS in court on one case. One of the reasons that I prefer the US version is because it is a lot more morally ambiguous than the UK version. Funnily enough if any of the prosecutors pulled any of the stunts that McCoy did they would be more likely to find themselves pulled up in front of the Bar Council Disciplinary Committee. So what about Judge John Deed? Let me start by saying that it was one of the few television programmes that made me want to physically throw something at the television within thirty minutes of me starting to watch it. If you believe Judge John Deed then judges spend part of their time interfering in cases or getting their clerk to do so on their behalf or having clandestine meetings. This is certainly not the case in real life. Firstly, judges never investigate cases – why should they? It is not their duty to do so. They are there to listen to and weigh up the evidence before them before coming to a decision. They may request the parties to furnish the court with some evidence but the judge would not (unlike in Judge John Deed) interfere in an investigation. Secondly, a judge would never hear a case where any of the barristers (prosecuting or defence) is their spouse, partner or girlfriend. This would definitely not happen. Thirdly, it would be totally inappropriate for a judge and/or barristers to start having a relationship with any of the parties. They would certainly have to recuse themselves from the case. To put it more succinctly, if any of the judges that I knew (and I know a lot of judges) did half the things that Judge John Deed did then they would be off the bench as quickly as it could be organised. It would also give grounds for an appeal. The legal system in the UK is vastly different than that of the US. To begin with in the UK you have barristers and solicitors. In the UK barristers generally are the only ones that can appear before a judge in a case, as they are the “advocate”. Furthermore, solicitors have generally tended to be the only ones who are allowed to have direct contact with the client. New laws have, however, changed the division of roles between barristers and solicitors. This is unlike in the US where attorneys not only appear in court but also have direct contact with the client. One of the biggest differences however is the fact that unlike in the US where you have an automatic right of appeal that is not the case in the UK. In the UK it is the judge (in the case of the US this would be the trial judge) that decides whether or not to give permission to appeal. If the judge that hears the case decides not to give permission to appeal then all is not lost because the losing party can then (and only after permission to appeal has been denied by the judge who heard the case) apply to the higher court for permission to appeal. A decision is then made. Applying to the higher court directly does not give you an automatic right of appeal. They may still be refused that right. Whilst the American legal system has its basis in English law there are still some big differences in not only the legal structure but also the way in which cases are heard. Finally, in the UK jurors are selected at random, unlike in the US where jurors can be analysed and challenged by the attorneys of both sides. In the UK we have one court system whereas in the US you have the Federal and the State system. In the UK cases start either in the Magistrates court (for criminal cases) or the County Court (for civil cases). Depending on the seriousness of the criminal case (e.g. murder, manslaughter, or armed robbery) then they will be heard in a Crown Court by a judge and jury, or if it is felt that the Magistrates sentencing powers are not enough then the sentencing part of the case would be transferred to the Crown Court to be dealt with. Appeals from Magistrates Courts also go to the Crown Court. The next tier is the High Court which deals with civil cases, hears appeals in criminal cases, and also has the power to review the actions of individuals or organisations to make sure they have acted legally and justly. The High Court has three divisions--the Family Division, the Chancery Division, and the Queen’s bench Division. Appeals from the High Court go to either to the Criminal Court of Appeal or the Civil Court of Appeal. As for the Supreme Court - The UK Supreme Court deals with civil and criminal appeals from the Court of Appeal, or in some cases the High Court where the case involves a point of law or is of general public importance. In the Supreme Court in the UK the judges also sit as a constitution of 5, 7, or 9 depending on the seriousness of the case. Furthermore, unlike in the US where the parties have a limited time in which to present their cases, in the UK cases are listed for hearing for as long as they are judged to take and counsel are not restricted by time limits in the presentation of their argument to the Judges. That being said, what are the worst mistakes that I have seen writers make? Generally speaking authors don’t make as many mistakes as television writers do. It could be because they have a lot more time in which to explain things. The worst mistakes I have seen relate mainly to television as opposed to books. 1. Not getting court procedure right. – Getting court procedure right is pretty basic and fundamental and there is no reason not to. – It is easy to check and can be done by spending some time in court whether it be a criminal court or a court that hears civil cases. 2. Interrupting the Judge in mid-sentence or ignoring a judge’s ruling – Whilst it might make a court case interesting, interrupting a judge whilst he is talking in court is a big breach of protocol. Not only do you not hear what the judge is saying, you do yourself and your client a disservice. Added to that if a judge makes a ruling in court he expects it to be obeyed. It also shows that you are not aware of how parties are supposed to appear in court. In the UK you are not going to see counsel being given a dressing- down in the Judges chambers. 3. Not getting the titles of Judges right! How difficult is it to ensure that you have done your research properly? The different levels of Judges have different titles. 4. The “CSI effect” – DNA evidence is not produced by the click of your fingers. It takes time, sometimes months. 5. Expecting judgment to be given immediately. This does not happen. With a case that involves a jury they will go and deliberate and come to a decision. If it is a case that is heard solely by a judge then he is likely to reserve judgment and it may take sometime before it is given. One gets a lot of joy out of reading crime novels and watching programmes on television especially where the research has been done properly. DEBS: Thanks, Ayo! Ayo will be checking in today if Reds or readers have more questions for her. And I have a few, as in "Did even Rumpole get it wrong? Tell me it's not so! ", and "What's with the wigs, anyway?" Wigs! There is a long standing debate as to whether or not wigs should still be worn. Some see the wearing of wigs as archaic, but I have also heard that in criminal cases the criminals prefer that the judges wear their wigs and also counsel as they then take the hearing a lot more seriously. Wigs are not worn by Judges in the Family Division as they want to be seen as a lot more relaxed when dealing with children. In the Supreme Court the Justices don't wear wigs or robes. They have also just agreed on Monday (21 November) to relax the dress code for counsel (as long as all parties agree). 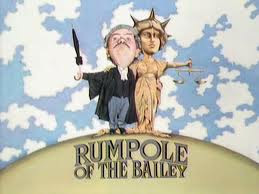 I am sorry to say that Rumpole was just as bad but enjoyable and even I managed to watch it without cringing too much. It must have been because of Leo McKern and "She who must be obeyed". Could you tell us a little about the Crime Festival? Great post, Ayo! I am a lawyer here in the US (what you would call a solicitor, though when I was younger, I was a barrister)and I share your frustration with TV shows that take too-great liberties with the law. There is enough disdain for lawyers out there without portraying us as oblivious to conflicts of interest, not to mention rude in court. Judge John Deed is unknown to me, and it sounds as though that is all to the good! So interesting, Ayo! I loved Leo McKern and Rumpole as well, and didn't give a toss (I wonder if I'm using that correctly) whether what he said/did was technically correct. I always thought that the British system was also different in the basic premise: in the US defendants are "innocent until proven guilt" so it's up to the prosecution to make their case; but in the UK isn't it different? And how about news coverage? We have a dear friend who's a Brit--and he's astonished and appalled by what reporters in the US can say. Can you tell a bit about that? So lovely to see you here! Helloe Ayo: good to have you on Jungle Red. I adored Rumpole but always questioned the way he was allowed to operate in court and to twist things around. Of course one has to adapt reality to make fiction exciting. Real police officers spend most of their lives doing paperwork or on extremely petty and boring cases. Ayo, that is fascinating about the wigs. I think if I were the defendant, I'd be more intimidated by the judge and prosecutors in wigs than without. It certainly makes sense that they should not be worn in Family Court, however. I suspect you've caught a few of us out. I have once or twice sped up DNA results, because the time frame of my stories is usually very compressed. But I've at least had an excuse, as in Kincaid having a contact in the lab and begging a favor, and I usually try to write around the DNA issue. Ayo, thanks for pointing out some of the key features of the British system. As an American lawyer, I think what Shaw said about the UK and US being "two nations divided by a common language" probably also described our legal systems! And you're right: if Jack McCoy were ever called before the State Bar Disciplinary Committee, he'd need a good defense lawyer! Yes, as a big Rumpole fan, I was not burdened by actually knowing how the British system really worked. However, my brother is a Superior Court judge in New Jersey, and he's presiding judge, which means he has a big hand in making it run smoothly. There is a fairly successful mystery series that takes place in his courthouse. Luckily it is comedic, which covers an enormous amount of errors, but I got one of the books for my brother and he just couldn't even read it. Cool post, Ayo! Thanks for your insight. If I were a defendant, I'd like to be the one wearing one of those funky wigs. Hallie, yes you did get it correct! In the UK it is the same as that the accused is innocent until proven guilty. It is up to the defence to prove guilt. Hank, they have very strict reporting restrictions on cases here in the UK. If something is said that my prejudice the case (especially if the jury get to hear it) then it could be considered to be breach of the reporting restricions, perverting the course of justice etc. It could also give grounds for appeal. Anything can be said after the case has been heard but not beforehand. Counsel would never go and give a statement to reporters after a day's hearing in court. One place reporters do not want to find themselves is in front of the judge because they have said something they are not supposed to. Rhys, Rumpole was always a bit over the top and counsel would never behave the way he did in court in real life. Muttering an aside because he was not happy about what the judge said or answering back would not be tolerated. There is always an air of dignity in the courtroom. Jan, I have every sympathy for your brother. I also agree that the judges have a big hand in the way in which their courts are run especially when they sit alone. In the Court of Appeal in the UK when they sit in 3s it is the senior judge of the constitution that is in charge. When I worked for the President of the Family Division as his clerk I had a lot to do with ensuring that his court was run smoothly.Clerks in the UK are different than clerks in the US. They are not used the same way. Thanks Sean, pleased you enjoyed it! Law & Order TV Show has a fantastic storyline. This is brilliantly executed show. I like it and I always watch it on net. Classic Cop Shows..or are they? What Makes Your Thanksgiving Menu? Halloween Is Over and That Can Only Mean . . .